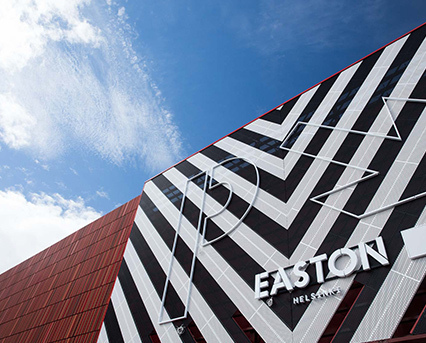 Easton Helsinki – celebrating its grand opening in October 2017 – is a shopping centre that reflects the culture and values of the people around it. Easton is about a sense of community, an easier every day, and some of the best food to be found in east Helsinki! In addition to a completely renovated K-Citymarket for your grocery shopping, Easton brings a whole new range of cafes and restaurants. With options for casual dining, cosy conversations and more, Easton combines the best of international food trends with fresh local ingredients. And there’s even more food inspiration here on the Easton website, with tips and inspiration for cooking at home! Easton is aimed at making the everyday lives of the inhabitants of east Helsinki easier and more fun. It’s a relaxed venue for shopping, daily activities and socializing with friends – both during the week and on the weekend. With modern architecture and a warm urban feel, Easton supports the identity of east Helsinki with a safe and lively environment for locals and visitors alike. Location and community are at the heart of Easton, which is why residents have been included in planning from the beginning. With the help of the “Wise People of East Helsinki” development group – comprising local people of different ages – the Easton team has created an environment to really serve local needs. The Easton loyalty program (Sitä itää) has also been created to support the community, with an innovative system that allows members to suggest and vote for local development projects that need sponsorship. The aim is to build a better east Helsinki – one loyalty point at a time! Easton is located next to the Itäväylä Road, at Kauppakartanonkatu 3. A shopping centre full of restaurants, cafes and stores!